Of all the big, huge Miscanthus on the market this one appeals to us the most. Fine vertical then arching blades have edges lined in white. 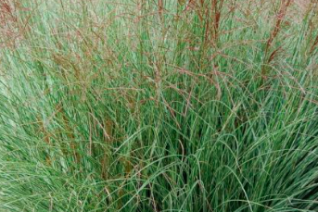 It gives the whole mature clump (to 5′) a soft, texture and overall appearance. In late summer into autumn mahogany red feathery flower clusters decorate the stems tips. The rise another 10 inches above the clump. Easy to grow in full sun to very light shade in any rich to average soil with adequate summer moisture. Clumps expand quickly and can easily approach 3′ wide. Cut back in winter- this grass has a bad habit in winter dormancy of detaching in wind and blowing about. But you can also leave it skeleton for winter interest and cut it back in spring. Regular summer water improves appearance and leads to blooms. Fully hardy. Winter deciduous. Japan.